About 2 miles north of the Carara Park and Tárcoles bridge is where you'll find this hidden treasure of a property. 18.6 acres of land with 262 meters (850 feet) of road frontage, about 600 fruit trees of all sorts of varieties, beautifully kept grounds which seem like a big green carpet, long paved driveway all the way to the top where the house and the pool sit on, from which you'll be able to fully appreciate the vivid multicolored sunsets over the Pacific Ocean. 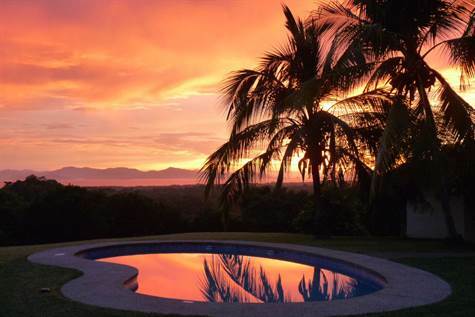 The home has 3 bedrooms, 2.5 baths, the second story it's reserved for the master bedroom with its private bathroom and a balcony with rocking chairs, an even higher point for the panoramic views of the Gulf of Nicoya, Carara Park and the mountains. The house is solidly built and throughout it you'll appreciate the high wooden ceilings, perfect for the hot weather, although there's also A/C units in all the bedrooms for your comfort. The pool was built by the renowned Piscinas Acuarium, there's a BBQ area, 2 car garage, 2 separate cabins: one for the security guard, the other for the cleaning / grounds keeping staff and finally 2 storage rooms: one for tools and the other for general purpose along with a freezer. There's neighborhood association supported security and the property has municipal water and a private well for the pool and to irrigate the land in the summer. Another thing to consider is that this could be the perfect family compound, there's so much room to built and you would get ocean view from several spots in the property. It call also be subdivided into smaller parcels. You'd be only about 25 to Herradura and Los Sueños Marina and 5 more minutes to Jacó. And the airport is a little over an hour away, but you'll be looking forward to get back here in no time.